Winter Sky by Patricia Reilly Giff, a Mysterious Review. Review: One of the last things Siria's mother told her before she died was to "Look out for your pop". And Siria has taken that to heart. When she hears the fire alarms in the distance, she knows her firefighter father will be there to put out the fire and rescue any that may be trapped. 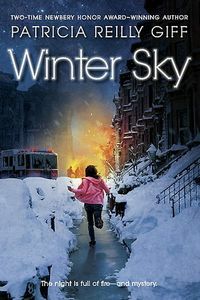 But when she suspects someone in her neighborhood may be deliberately setting fires, she sets out to identify the culprit in Winter Sky, a novel for readers aged 8 to 12 by Patricia Reilly Giff. Siria, named after the brightest star in the night sky Sirius, first spots a shed that is smoking, a small fire within. She also sees a mangy dog at the site, which scares her away. The fire apparently died on its own because there was no alarm sounded for it, but she's concerned for the dog, who looked to be hungry and alone. When she goes back to investigate the site, she finds a scrap of material, identical to that of a coat owned by her best friend, Douglas. Could it be possible that Douglas is starting fires, fires that would endanger not only residents of the neighborhood but also the firefighters responsible for putting them out, a group of men and women that include her father? Winter Sky is a very sweet novel. It's clear that Siria feels the weight of the world on her shoulders. She has to honor her mother's dying wish all the whole protecting her father from a suspected arsonist. That's a lot to expect of a young girl, but Siria feels up to the task. For inspiration she refers to a journal of star maps her mother made for her, each accompanied by a short story about the figures in the sky. (These journal entries appear every couple of chapters or so in the book.) After her father is injured on the job, she gets up the courage to confront Douglas. He's hurt that she could think such a thing of him, and then turns away, even though the evidence seems to point directly to him. Meanwhile, Siria puts her considerable energy into finding the dog. When she does, it's a harrowing experience for her to free him from a freezing stream, but a rewarding one when it brings them together. In many ways more fantasy fiction than not — there is no way, for example, any responsible parent or guardian would knowingly allow Siria to wander around the city unaccompanied at night — this is, still, a quite remarkable novel of family and friends, safety and peril, courage and humility. It is highly recommended, not only for its intended audience of middle grade readers but for their parents as well. Acknowledgment: Random House provided a copy of Winter Sky for this review.